On all camping trips a shortened medical must be filled out. This is called Part A and Part B medical. This is not medical form needed to be filled out by a doctor. It is not to be confused with medical for summer camp which does have to include doctors visit. If you have already filled one out and turned it in then you don’t need to fill out another one. For those who have not turned in Part A and Part B medical and are attending next camping trip please fill it out and bring with permission slip and fee on Nov 16th. Any questions or concerns please contact me. This is the link to thePart A and B medical form. Just a reminder – we must retrain in Youth Protection every two years. Please be sure to go on line and take this 20-30 minutes course. It is very important that this requirement be met. Also, we can not list members on the charter if they have not also taken the church VIRTUS training. If you have not taken this one time training, please arrange to take this training as soon as possible. As soon as you have done either of the above, be sure to send a copy of your certificate to Tom Kramer or me. To access the Members Only Areas troop members and leaders may contact the webmaster for the password. Welcome to the home of Troop 23, the oldest Boy Scout Troop in the United States chartered by a Catholic Church. Please follow the links on the side of the page to navigate to different sections of the site. The NEWS page takes you to current Troop announcements and events. Also on the News page are other Scouting linksthat may be of interest. You can also follow the other pages along the side of this page to other areas of the Troop site. 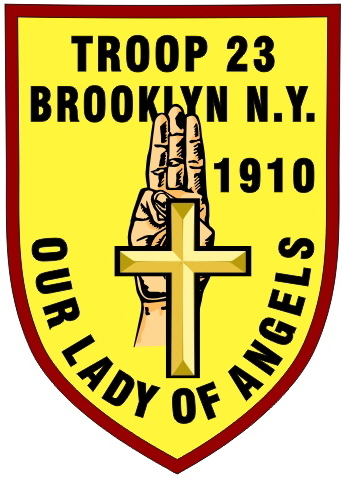 Troop 23 is located in the Bay Ridge neighborhood of Brooklyn, New York. The Troop is part of the Lenape Bay District of the Greater New York Council. The Troop meets every Monday night at 7p.m. in the school Cafeteria in the basement of Holy Angels Academy/Our Lady Of Angels School. The school is located on 73rd. Street between 3rd and 4th Avenues. Troop 23 has a very old and proud history. Please feel free to stop down and join us any Monday! For any commets, questions, suggestions or corrections on any page please contact the Webmaster.